In the latest enforcement of a recently adopted policy against the distribution of hacked materials, Twitter has moved to vanquish the account of a hacking group believed to have pilfered thousands of insurance-related documents from a US law firm linked to the September 11, 2001 terrorist attacks. The policy, which forbids the spread of stolen “private information or trade secrets,” is but one of several implemented this October in the face of increased scrutiny by Washington lawmakers, due to what US intelligence portrayed as the weaponisation of social media by entities tied to the Russian government. Black-hat hackers have for years spread stolen material on the platform, often with little or no consequence. Hacktivist groups like Anonymous and LulzSec are but two examples of popular accounts where, as far back as 2011, links to confidential data lifted from the servers of major corporations were openly shared. With this latest action, however, Twitter is ostensibly confirming that an era of unchecked propagation of stolen secrets is now coming to a close. The account suspended by Twitter was recently created by an established hacking group calling itself The Dark Overlord. The group had announced Monday the theft of what it said were roughly 18,000 confidential documents related to the World Trade Center attacks, which it claimed to have stolen from a company handling related insurance litigation. A reliable source of breach-related news, databreaches.net, noted on Wednesday that the initial hack, first reported in April, had garnered little attention from the press. (The site also obtained exclusive files from the hackers themselves.) Dark Overlord identified multiple insurance firms from which it claimed it acquired the stolen cache: Hiscox Syndicates Ltd., Lloyd’s of London, and Silverstein Properties. Hiscox sought to distance itself from the breach in a public statement, saying its IT infrastructure is in no way linked to a law firm that it hired, which it claimed is the source of the leaked material. 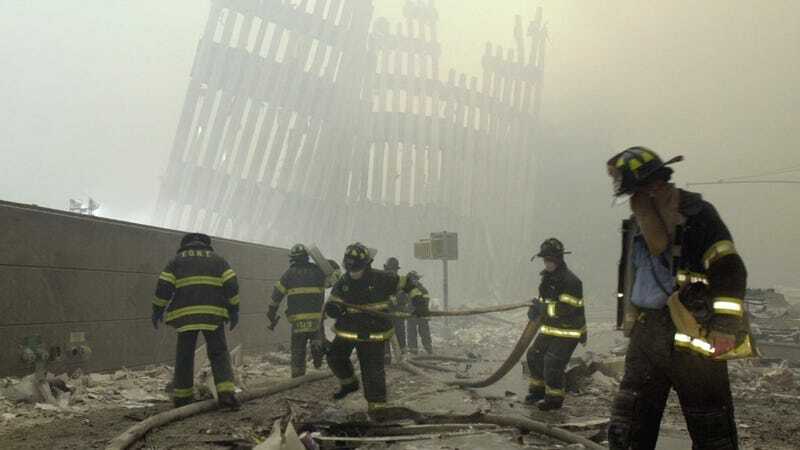 “One of the cases the law firm handled for Hiscox and other insurers related to subrogation litigation arising from the events of 9/11, and we believe that information relating to this was stolen during that breach,” the company said. Notably, while the group says to have hacked each of the three insurance firms it identified, Hiscox’s statement casts doubt on that claim, specifically by implicating a single law firm as the source. The law firm itself has not yet been identified and the Dark Overlord reportedly declined to explain itself after Hiscox’s response. Lloyd’s of London and Silverstein Properties could not be immediately reached for comment. What sorts of documents, specifically? E-mails, retainer agreements, non-disclosure agreements, settlements, litigation strategies, liability analysis, defence formations, collection of expert witness testimonies, testimonies, communications with government officials in countries all over the world, voice mails, dealings with the FBI, USDOJ, DOD, and more, confidential communications, and so much more. Potentially, the dredging up of conspiratorial notions about 9/11 is a tactic to inflame attention on social media and force the hands of those who stand to lose most by having proprietary information spread online; chiefly, the attorneys and various insurers involved.